Last week, the State’s ten Regional Economic Development Councils (REDC) once again pitched their plans for hundreds of millions of dollars in state funds. I was honored to be named by Speaker Carl Heastie as one of two Assembly members on the panel that reviews the proposals. The Strategic Implementation Assessment Team (SIAT) is responsible for reviewing the 2015 REDC progress reports, Round V proposals submitted by the ten councils, and the seven eligible Upstate Revitalization Initiative plans. All ten councils are eligible for $750 million in funding through the Consolidated Funding Application process, while seven Councils (excluding New York City, Long Island, and Western New York) will compete for $500 million as part of the Upstate Revitalization Initiative. SIAT will make recommendations to Empire State Development on how the money should be awarded. If you haven’t yet seen the Southern Tier’s proposal, you can learn more about it in this video. I know that I’m biased, but the Southern Tier’s plan was excellent and I was very proud of the team that team that presented it. I participated in a public hearing in Albany on October 21st to express my continued concerns over the pace of the closures of developmental centers across the state. Currently there are 400 people in institutional settings like Broome Developmental Center (BDC); part of the Office for People With Developmental Disabilities’ (OPWDD) plan calls for that number to be reduced to 150. While I certainly believe every individual has the right to live in the most integrated setting possible, we need to have enough capacity in the system to accommodate those who cannot safely make that transition. I raised this point again during the hearing, Helene DeSanto, Deputy Commissioner for Service Delivery responded by saying if that number is found to be unattainable, OPWDD would reexamine the number of institutional beds going forward. An additional series of meetings designed to gain feedback on OPWDD’s Transformation Agenda were held cross the state. If you would like to comment on the Transformation Agenda, I would strongly encourage you to send an email to: transformation.panel@opwdd.ny.gov. Assemblywoman Lupardo and Assemblywoman Aileen Gunther listen to testimony at a hearing in Albany on services for the developmentally disabled. The week of October 19th was recognized nationally as Lights on Afterschool Week. Locally, the Expanded Learning Network of Broome & Tioga (ELN) has been doing tremendous work creating awareness of available afterschool programming in our community, as well as advocating for resources to help grow offerings in the area. During Lights on Afterschool Week, 15 local providers held open houses to showcase their programs. If you didn’t get the chance to attend, you can learn more about the importance of afterschool by reading a guest viewpoint I wrote that was published in the Press & Sun Bulletin on October 18th; you can also see how one local program has been affecting students by watching this video produced by my office. I also announced that I was able to obtain a $150,000 grant for the Binghamton School District to help pay for afterschool programs in both middle schools. It is important that we continue to ‘keep the lights on afterschool,’ even though this advocacy period has come to an end. For more information on available programs and how you can get involved, visit ELN’s website. On October 21st, I joined the Governor as he signed a series of bills aimed at furthering protections and opportunities for women in our state. Among these bills are measures to ensure equal pay for women who perform the same work as their male colleagues, stronger protections for victims of sexual assault and sexual harassment, and stronger penalties for human trafficking. As the Chair of the Legislative Women’s Caucus (LWC), I am committed to continuing this important work to ensure that every woman in New York is treated fairly. We’ve come a long way, and these new laws bring us even further, but we can still do more. For more on this historic legislation, click here. 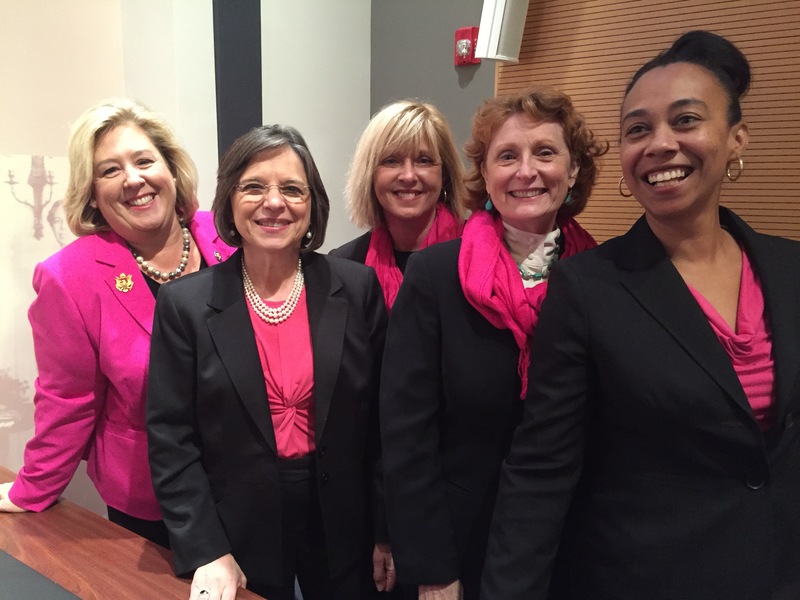 Women’s Caucus members (left to right) Assemblywoman Rebecca Seawright, Assemblywoman Lupardo, Assemblywoman Michelle Schimel, Assemblywoman Jo Anne Simon, and Assemblywoman Michele Titus at the signing of women’s bills in New York City. 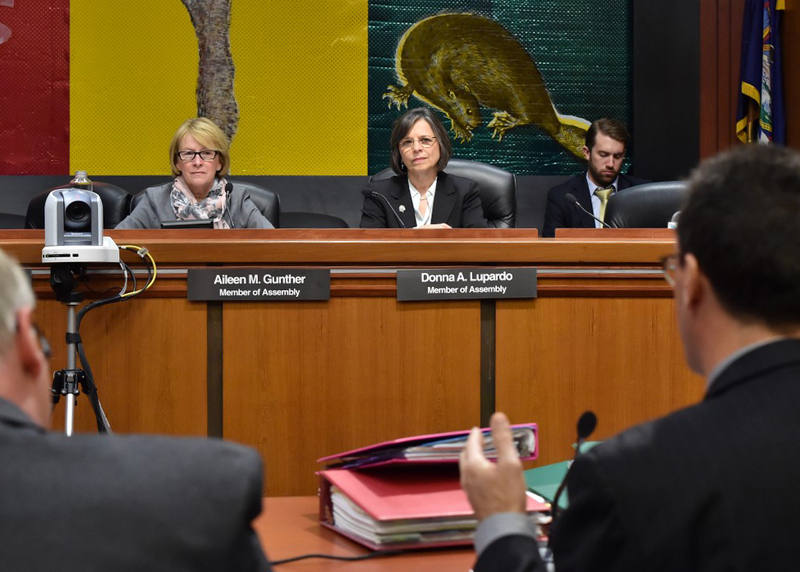 As Chair of the Assembly Committee on Children and Families, I’m continuing to look at ways to provide better services for families in our community and across the state. Earlier this year, Speaker Heastie reconvened the Assembly Child Care Workgroup which was charged with identifying solutions to improve child care in the state. This month we held three meetings to examine a number of critical issues facing the system. We looked at how the expansion of pre-k is affecting the overall delivery of child care, what effect the re-authorization of the Federal Child Care and Development Block Grant will have on the system, and whether the current market rate reimbursement system is adequate to cover the cost of care and provide access to low income families. We will be developing budget and legislative initiatives as a result of these meetings and they will be major topics for the upcoming legislative session. 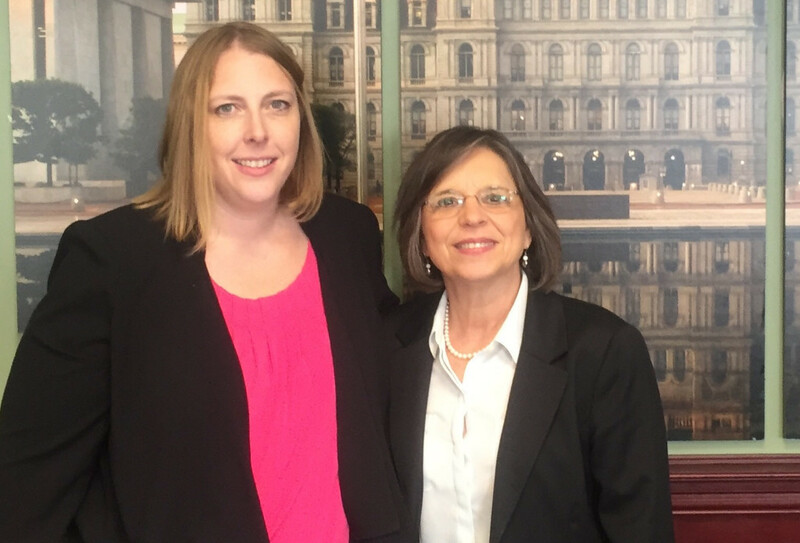 Jenn Perney of Family Enrichment Network joins Assemblywoman Lupardo in Albany for a Child Care Roundtable discussion. Patients in home care settings can now receive better treatment with a bill signed by the Governor on October 26th. I was the prime co-sponsor of Assembly bill A1323, also known as the CARE Act, which passed unanimously in the Assembly on June 1st. This bill requires hospitals to inform a designated caregiver of a patient’s care plan and offer certain training that allows for the proper administration of this plan. Family members caring for loved-ones at home are often expected to perform difficult tasks such as administering medication, tending to wounds, and operating medical equipment. The CARE Act will provide them with the information and training needed to properly execute this care. This is an invaluable service as it will help lower hospital readmission rates and saves millions of dollars in associated health care costs.